Wildebeest migration originates from Tanzania when thousands of mammals mostly the wildebeest and others like gazelles and zebras, embark on a journey of over 1000km from Ngorongoro Conservation area within Serengeti National Park where the real action and drama takes place, the mammals then head up to Masai Mara Game reserve in Kenya and then back to Tanzania. If you missed this action this year, worry not, Wildebeest is an annual event when mammals so you can catch up with it any year of your convenience. Do these mammals simply love to adventure and travel from one place to another or they are compelled to move?. We get to see giant herds of wildebeests over 1 million, hundreds gazelles, zebras and many others on the move, the reason is simple, these animals look for green pastures and water. Rainfall greatly influences the movements, the wildebeest need to follow , they can not survive in dry plains or semi desert places, that is why they move for over 2000km in a clockwise manner in search of the tender and nutritious grass, they have no option but to risk their lives or the lives of their young ones during the trek as predators like lions station themselves waiting for the weak prey. Before the movements begin, the young wildebeests are trained and guided throughout the plains in their first year of life by their mothers probably to show them the routes although its believed that these routes keep changing due to the changing patterns of the rainfall. Did you that the wildebeest have the capacity to sense the rains from a distance of over 45km, probably they can smell the rains in a distance but no one knows. 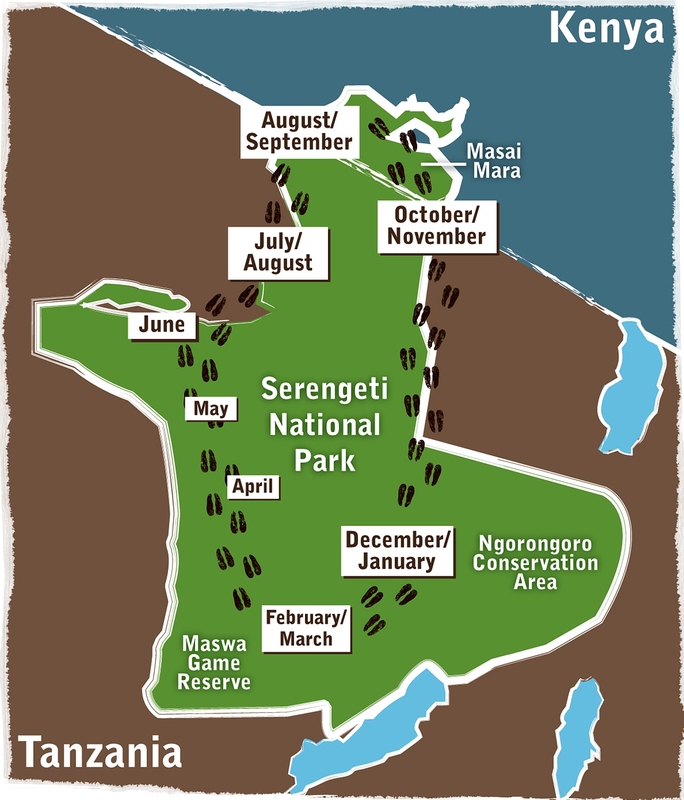 The cycle begins in Serengeti National Park / Ngorongoro Conservation Area, in the month of December – March, during this time there are rains that boost the growth of the grass that the giants herds can graze on. January – March is a calving when most of the wildebeests give birth around Ngorongoro Conservation Area, the young ones are nurtured and prepared for the great exodus. Usually predators as well camp in this area to target the young and vulnerable wildebeests. Having camped here, the plains start to dry out and the herds can’t afford to keep here, so they migrate to the western side of Serengeti National Park close to Lake Victoria in the months of April, May and June because of the heavy rains. 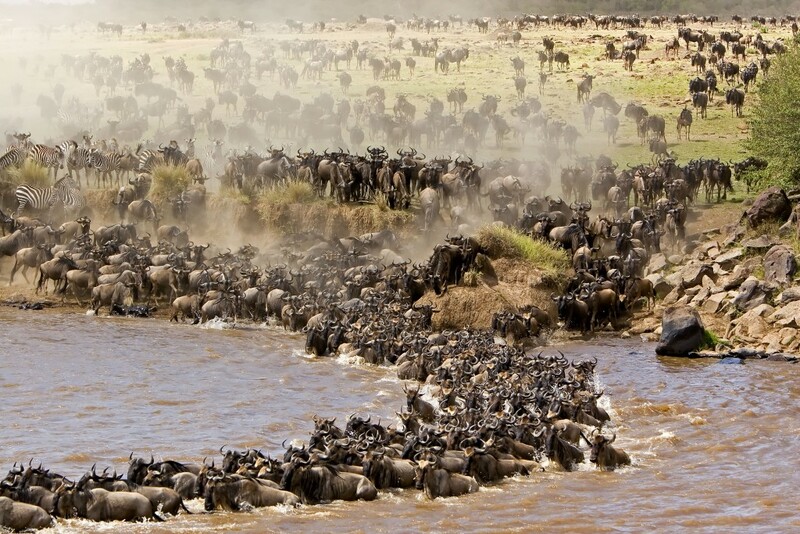 By the end of July, throughout to October the giant herds start to cross the Mara River. Here is a place of best actions when both the crocodiles and other predator take advantage, and usually there so many accidents as a number of the mammals drown in the river. In these months the wildebeest settle in Northern Serengeti and Masai Mara meaning they are visible in both National Parks, Serengeti National Park being the most preferred. 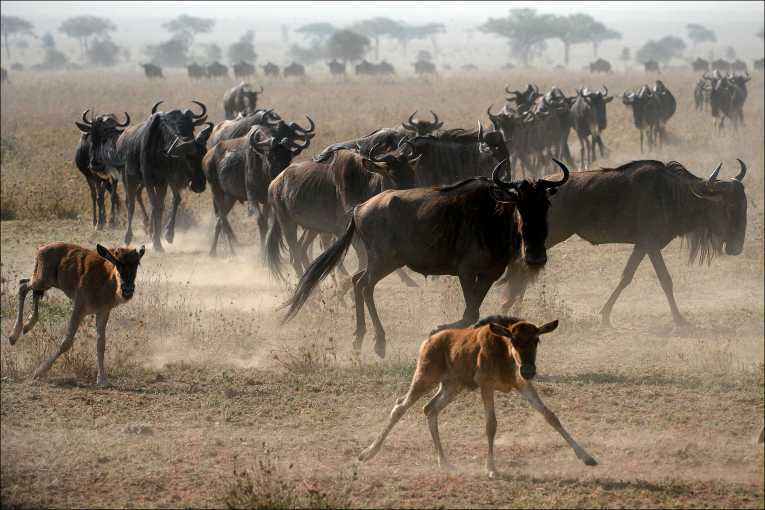 November usually comes with rains which attract the wildebeest to migrate south ward of Serengeti National Park to complete the cycle. This entry was posted in Africa Safaris Blog and tagged kenya, Masai mara Game Reserve, safari, Tanzania, Wildebeest Migration Serengeti National Park by Gorillas & East Africa Safaris. Bookmark the permalink.